Komt means “he, she, or it comes” and is pronounced with a full, rounded “oh,” like in “road.” KOHMt. De maitiid has been covered in the previous post. Yn is a cognate. It means “in” and is prenounced with a long “ee” sound, as in “seen.” EEn. Remember to distinguish it from the West Frisian in meaning “a” or “an” and pronounced with a schwa. It means “the” or “it” and is said with a schwa. UHt. Lân means “land” and is pronounced with a long “ah” as in “father.” Actually, it sounds a lot like the English word “lawn.” That should make it easier to remember. 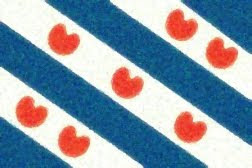 You also see this word in the West Frisian for Frisia itself: Fryslân. Say it with a long “ee” in the first syllable, and accent on the first syllable. FREES-lahn. Notice that the website translates this as everything smiles upon you, which conveys the connotation quite well: this is a nice children’s song, after all, celebrating the arrival of spring. When we say that everything is laughing at you in English, that is not so nice. Laket means that something or someone is laughing. Say it with a long “ah” in the first syllable and a schwa in the second syllable. LAH-kuht. The infinitive of the verb is laitsje ("to laugh"), which is said like the word “lie” followed by a –ts- sound, a –y-, and schwa. LIGH-tsyuh. Alles means what it looks like, “all.” Say the first syllable with the “o” in words like “pot” or “cot” that sounds very similar to a long “ah” and use a schwa in the second syllable. It sounds a lot like the English word “soulless” with the s- dropped and shorter –ou- sound. Jin as several meanings, including a formal or plural “you.” It is said with a y- and an “ih” like in “bit.” YIHn. Sa means “so” and is pronounced with an “ah,” rather like the English word “saw” with a less drawn-out vowel ending. This word shows up a lot. Fortunately, it looks like its English cognate. Oan has all kinds of meanings and appears all over the place in West Frisian. It can mean “on, to, in, upon, near, along...” and so on. Take a look at this online dictionary entry to get an idea of how versatile oan is. Say it with a round “oh” like in “boat” and a schwa before the final -n. OHuhn. I would not be too surprised if the schwa gets blurred away in the spoken language, though. So it might sound more like the word “own” in everyday speech. That should be enough Frisian vocabulary for one day. Part II will be up soon.